We use a lot of cardamom in our baking. In fact, in Scandinavia, it is rare that we use cardamom in savoury foods at all – it’s all about cakes and buns with cardamom. This is a good, solid gooey brownie – topped with a delicious soft caramel, flavoured with a hint of cardamom and vanilla. To grind your own cardamom, take the pods and open them up and remove the little seeds inside. Grind these seeds in a pestle and mortar and sieve out the grainy shell. Freshly ground cardamom is very strong and fragrant – so test your way with smaller amounts in case you may find it too over-powering. Pre-heat the oven to 180C (170C fan). Melt the chocolate and butter in a pan over simmering water until smooth (you can also do this in the microwave). Set aside to cool for a while – it should be finger warm when using. Whisk the sugar and eggs for several minutes until pale and very fluffy. There are no raising agents in this recipe and you do need a lot of air incorporated to make this brownie a success. In a bowl, sift cocoa, flour, salt, cardamom and vanilla sugar. Add the chocolate and butter mixture slowly to the egg and sugar and whisk continuously. Then fold in the flour with a spatula, ensuring as much air still remains in the batter. Lastly, add the pecan pieces. Pour into a small lined baking tin 20 x 30 cm approx. or smaller if you prefer a thicker brownie and bake for around 15 minutes - or until the middle no longer wobbles (baking time really depends on the tin you use – a thicker layer will need longer cooking). 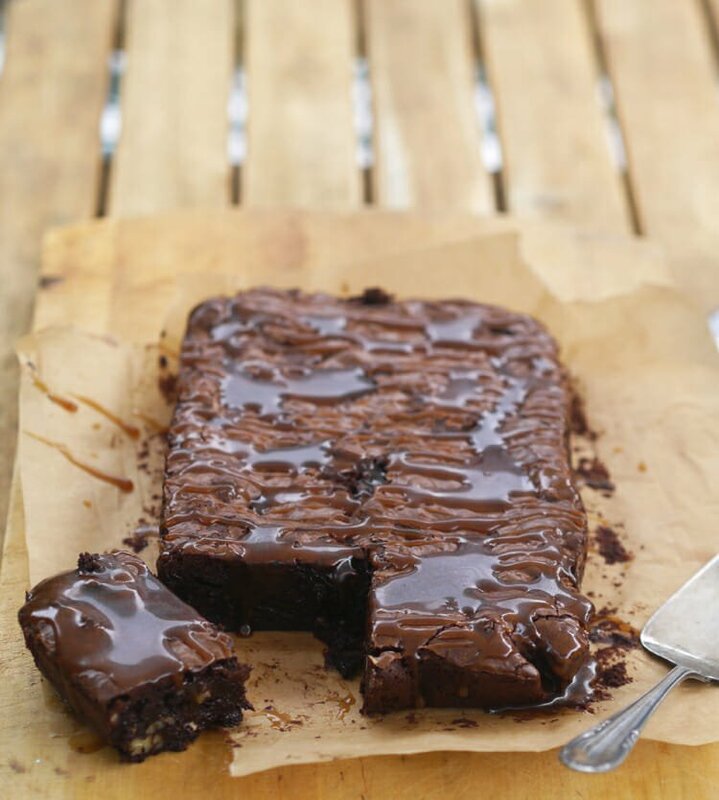 A good brownie is gooey and claggy and even 3 minutes of over-baking will ruin your hard work. Test your brownie after 10 minutes by moving the tin – if the middle wobbles, it still needs a few minutes. Keep testing. Remove and leave to cool. If you suspect the cake has had a minute too much, you can cool the tin down in ice-cold water to stop the cooking process immediately. In a small saucepan over heat, combine sugar, syrup and water (don’t stir it, but slightly swirl the pan once in a while). Bring to the boil and simmer until it starts to turn a brown colour (but not too dark, or your sugar is burning) – this may take 4-6 minutes, depending on the heat and quantity, so keep an eye on it. Add the butter and cook for a further few minutes, then turn heat right down and add the cream and spices. Add half the salt first and taste if this is salty enough for you. Let the topping cool down before pouring over the cooled brownie (I usually let both sit for a few hours before eating). Use any left over sauce as a topping on vanilla ice cream. It’s delicious.